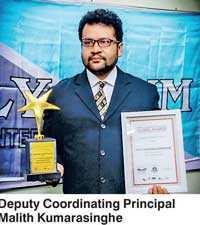 Malith Kumarasinghe, the Deputy Coordinating Principal of the Lyceum Group of Schools and Principal of Lyceum Nuwara Eliya, brought glory to both the school and Sri Lanka by bagging the prestigious Education Leadership Award at the World Education Congress Global Awards held at Taj Lands End Hotel, Mumbai recently. This award was one that was only awarded to the best schools from the global education community. Kumarasinghe thanked his parents, supporters and the management and teachers of Lyceum International School who inspired him to achieve many milestones in the field of education that led him to win this award. He pledged to continue his pursuit of educational excellence for the betterment of not only Lyceum International Schools but the wider education community of Sri Lanka.